This is the most amazing cheesecake ever! We had this a few years ago when we had Thanksgiving at The Ritz Carlton Amelia Island. Everyone had a piece of this cheesecake and loved it. It didn't have a sign next to it telling us what kind of cheesecake it was. We asked the waitress and she said it was pumpkin. We all said "No, we didn't have a pumpkin cheesecake." She said that was the only kind of cheesecake they were serving. Who know we all liked pumpkin cheesecake?! I asked the hotel for the recipe and they sent it to me. 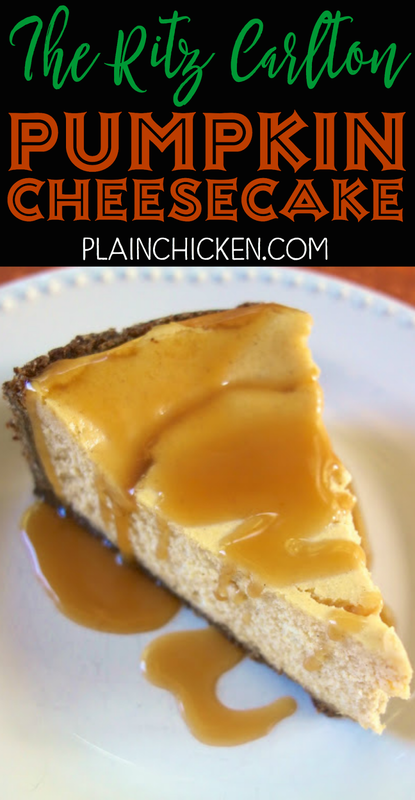 For all you pumpkin haters (myself included), you can't taste the pumpkin in this cheesecake. I tell everyone it is "Spiced Cheesecake" so people will try it before they pass judgement. Everyone loves it. 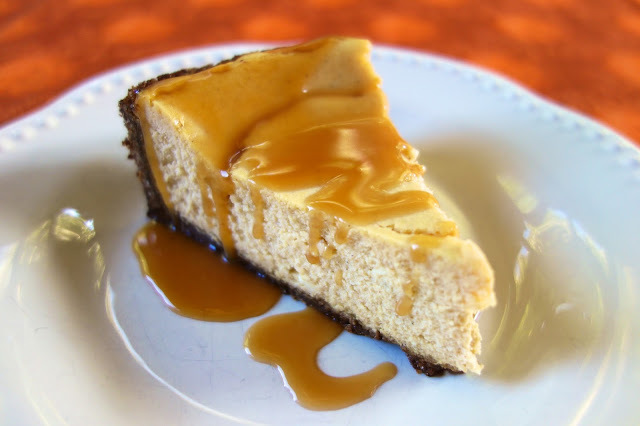 This cheesecake is great on its own, but it is over the top amazing with the homemade caramel sauce! I had to give most of this cheesecake away so I wouldn't eat it all myself. I had no self-control around it. Give this a try, even if you don't like pumpkin. I promise you won't be disappointed! In the bowl of a stand mixer, blend sugar, cornstarch, and butter. Add cream cheese, beat until soft, scrape bowl well. On first speed add eggs slowly, scrape bowl well. Add cream and vanilla. Add pumpkin puree and pumpkin spice to cheesecake batter. Pour in pan (may have some leftover batter) and bake for 45 minutes, rotate bake for additional 15 minutes or until cheesecake has risen and feels firm on top. Caramelize butter and sugar in sauce pan until medium amber color. Whisk in cream, may splatter hot liquid. Cool and drizzle over cheesecake. This may be a really stupid question, but 5 1/2 eggs? For the 1/2 egg, would you use yolk or white? Whisk up the egg and use half of it. I have a scale and I weigh the egg and then pour half into the batter. This looks heavenly!! I love pumpkin & caramel! oh man this looks delicious ... I really need to invest in a standing mixer!!! you could use a hand mixer if you don't have a stand mixer. I'm drooling a little over here...or maybe a lot! I wish this would make an appearance on my Thanksgiving table! This looks delicious!! I love pumpkin cheesecake and usually make Emeril's recipe. In fact, it's in his online holiday cookbook that I pinned from you :-). How do you think this would be with a chocolate crust? Chocolate crust - that sounds good! If you try it, let me know how it turns out. THAT is a beautiful cheesecake, sister! Can not wait to make this!!!! 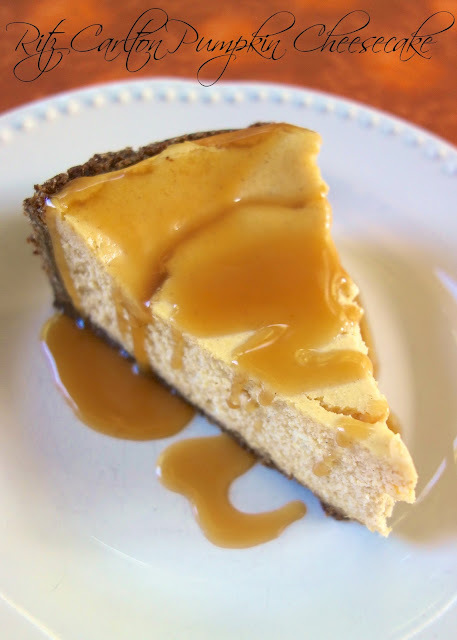 Do you think you could make this using an already prepared graham cracker pie crust? I don't have a Springform pan but would love to try this! Sure! This will probably make 2 or 3 cheesecakes using the pre-made crusts. Just don't overfill the crusts and you should be fine. I am making this for Thanksgiving and just noticed the 5 1/2 eggs - how do you split an egg? I think this cheesecake looks absolutely delicious and can't wait to see how it turns out. Also, since I am going to travel with it, should I wait to put the caramel sauce on until right before we serve it? I would add the caramel sauce right before you serve it, but it will be fine either way. WOW! This looks absolutely yummy..Very Nice post. I like it. I use to do buy online cheese cake as its time saving.very informative post about cheese cake.thanks for sharing this. Thank you for sharing this! It received rave reviews on Thanksgiving day! I used the ginger snaps for the crust which really was a great touch, instead of using graham crackers. I used 6 eggs and substituted an equal ammount of vanilla paste for the extract. I beat it for a while to make it fluffy. It was more mousse-like which was very welcome after a turkey dinner! Next time I will wrap foil around the base and a bit up the sides because my pan leaked butter. I highly recommend this recipe.